Lil Greenwood might be most well known as a vocalist with Duke Ellington's band for a few years starting in the late 1950s. She is featured on Ellington's album "My People," but her career as a recording artist in her own right was highlighted by more R&B-oriented sides she did in the early 1950s for Modern and Federal. Though she didn't have hits, Greenwood was one of many California-based singers in these years recording in a style intersecting jazz with blues and a bit of gospel, forming a dominant part of post-war R&B before that gave way to doo wop and rock 'n' roll. 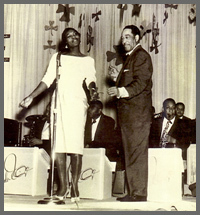 Greenwood had a strong voice, but didn't get the material that could establish her as a star artist, though some bigger R&B names are heard as accompanists on those sessions, like Camille Howard, Little Willie Littlefield, Thurston Harris, and members of the Johnny Otis Band.